Whether you're a fiction noob or a salty veteran, if you've read some books on the craft or done any poking around on the internet, chances are you've noticed two main schools of thought when it comes to approaching a project. There are those who believe it's best to plot the course of their work ahead of time, laying out the skeletal framework of the story before cutting into the first draft, and those who believe this approach is too restrictive, opting instead to dive right in and let the muse pull them along by the seat of their pants. One of the primary reasons I decided to delve into short fiction some time ago was for the freedom to experiment without an intimidating commitment to a longer work. This has allowed me to try a variety of approaches to writing in a relatively short time, and both methods have birthed stories I'm fond of. That being said, when the day comes that I decide to sit down and write a novel again, I will most likely be using an outline. I could fill an entire entry talking about my reasons, but at the end of the day, every writer is going to have to decide which method works best for them. Neither will bring universal success for everyone. We're all different. And that's why it gets my hackles raised whenever I hear someone saying their way is the right way, and everyone else should follow suit. There are pontificators on both sides, but most of the nay-saying I've seen has been aimed in the direction of outlines. Maybe it's just my own experience, but there seems to be a lot of "pantsers" who feel the need to justify their approach, usually by pointing out perceived negatives of the outlining process. Of course, there's nothing wrong with explaining why something doesn't work for you. But I've noticed a lot of myths and untruths being thrown out there. So, as someone who's put both methods to the test, I thought I'd put on my mythbuster hat and address some of them. This is probably the most common myth cited, and it's absolutely untrue. The outline itself is an expression of your creativity. It's the kick-off to the creative process. And once you're knee-deep into your first draft, the presence of that outline isn't going to make the muse abandon you to the wolves. The same creative mind that produced the outline is on board with you for the entire ride, and you should be putting it to work every step of the way, outline or no. More importantly, your outline is likely to leave plenty of room for exploration. Your story is not a sterile office building constructed from a two-dimensional blueprint. It's a vast, unexplored cave. That outline is just the dim, stuttering flare that you toss in before commencing your spelunking. It lights just enough of the path to keep your feet moving, but you still won't know for sure what’s around the next bend—or what’s going to leap out of the shadows. A big source of the doomsaying that revolves around outlines seems to be this strange idea that once you've written one, the work ahead of you is set in stone whether you like it or not. This is so far from the truth that I'm not even sure which angle to attack from. As long as the pen is in your hand, your story remains malleable, and if it wants to go somewhere contrary to your plans, the author is always free to let it roam. Sometimes the finished product won't even resemble the initial outline. This isn't a bad thing, and for outliners it often prevents the need for a comprehensive rewrite the second time through. You can hold that original outline up to the work in progress and gauge how far off course you are, examining the reasons why. The outline can be edited and adjusted just as readily as the first draft itself, avoiding plot holes and inconsistencies. I suspect this myth is related to the previous two. Some pantsers just seem accustomed to the idea that their method is the only way a story can truly take on a life of its own. Many writers will often speak of that feeling you get when your characters are fleshed out to the point that they feel alive. They start to feel like real people with their own thoughts and motivations, and might even resist your plans for them. There are differing opinions as to how far the writer should let them play about, but the feeling itself is pretty common, and it's not exclusive to those who write without an outline. In fact, I'd even argue that it can sometimes happen sooner with outliners, or at least it has in my experience. The reason for this is that when you engage in heavy planning before your story begins, you've already gotten to know your characters to a certain degree. Many of them come to life in the planning stage, and by the time you start writing your story, they're already alive and kicking. This idea that outlined characters are just lifeless puppets couldn't be further from the truth. Someone once argued to me that the reason I shouldn't outline my stories is because once I put my idea down on paper, it will have lost something to the void of the empty page. By the time I get to my first draft, they said, that initial spark of inspiration will be long gone, wasted on the outline instead of the story itself. My first draft would really be my second, prevented from living up to its potential. I asked this person if they'd ever finished anything longer than a flash piece, and they outright refused to answer. Putting aside the fact that this claim obviously reeks of superstition (I have a few of my own, after all), it still kind of baffles me that someone would think this way. Not only do I disagree, but I feel pretty much the opposite. The very moment I get a good idea, it goes down on paper, lest it be lost forever to the all-consuming emptiness that is my short-term memory. If you can only capture inspiration properly in the first draft, how on earth do you tackle the second? Heaven forbid you attempt a rewrite. I'm a pretty big believer in the muse (or the "muse-brain" at least), but I am not a slave to my own inspiration. The muse works for me, not the other way around. Finally, we end with a myth propagated not by the detractors, but by outliners themselves. If you're interested in giving outlines a try, there are quite a few tried and tested methods out there, from index cards to mind maps to snowflakes. Chances are you'll have to do a bit of experimentation before you find out what kind of outline works for you. Personally, I prefer a rough sketch of scenes in a simple word processor document. The longer the work is, the closer I tend to drift towards the index cards. But the way you outline your story is not what matters. Again, everyone is different. What's important is that your outline serves its purpose. That is, it should get you writing. More importantly, it should keep you writing. Be wary of anyone who claims their method is infallible and universal. If you take anything away from this entry, it should be that. No one has all the answers. Find what works for you. "The muse works for me, not the other way around." Thanks for a great post, James! You brought some awesome arguments to the table. I'm a big believer in outlines, whichever form they take, because they've not only rescued a big project of mine, but gave it a depth impossible to reach by pantsing it through. This is an aspect that I believe is often forgotten. Pantsers rarely, well, practically never write multi-threaded stories, stories with large casts and subplots, and intertwined character arcs. The more complex a story is, the more the necessity of an outline grows, simply because the human brain has limited capacities and a very limited memory of details. Big projects are simply impossible to achieve without order and planning. Nothing against single-threaded novels, by the way. Just pointing out the difference in effort and preparation that's necessary to complete each. Also... all those unfinished novels rotting in all those desk drawers? All those unrealized dreams that were left behind? How many of those were abandoned because the writers got stuck? Well, outlines are guaranteed writers' block deterrents. Just sayin'. That's a great point, Vero. If you're planning a complex tale with multiple subplots weaving throughout your work, you'll likely find a tough time of it working without an outline or notes of some kind. And you're right about the writer's block thing as well. If your manuscript isn't progressing, you can't blame it on writer's block if you've got an outline handy. As I mentioned in number two, the good thing about outlines is that they aren't set in stone. You can change them up as your story changes if you need to. It reminds me of the famous story of J.R.R. Tolkien working on Lord of the Rings. Supposedly he had his work all planned out and he wrote as planned up to the scene in The Prancing Pony, where this unplanned character by the name of Strider inserted himself into the story, much to the chagrin of Tolkien and his best laid plans. He went with his gut to see where it would take him, adjusted his plans accordingly, and we all know how that one turned out! So don't be discouraged. Great breakdown of the myths! Unfortunately I've tried outlining and it was less fruitful for me than pantsing and revising. Which is rather sad because I wanted it to work so badly, but right now it's just not the best way for me! So long as I keep my outline in my head it works out all right; it's just the writing it down that runs me into walls. I find putting an outline on paper actually does lessen my passion to write it, strangely enough, yet going back and revising scene-by-scene once the story is written doesn't bother me... go figure. Once I know what happens and have it set on paper, I start to get drawn away by a new story that's still a mystery. But knowing what happens in my head doesn't count and still leaves me trying to write more. Even I can't figure out why! Guess I'm just using the wrong methods. Maybe one day I'll give outlining another try, and find a way that works for me. Outline or no outline, the important part is that you find an approach that works for you. That's all that matters when the smoke clears and it's all said and done. There simply isn't a universal method that will work for everyone. It's good that you're experimenting and trying out the different approaches though! That's the only way to find out what the best fit for your writing is. Good luck, Juturna! That's another positive to having an outline. That first draft usually goes easier, often with less cleanup required when the revision process comes. I agree with all of these points. For once, I created an outline and I've not once been discouraged to keep to it. As a matter of fact, I enjoy that I am able to stick to my original story line AND come up with new and interesting ways to make those plot points happen. I don't feel restricted at all. That's what I enjoy about outlining as well, Diane. Sounds like you found the approach that works for you. I do still enjoy pantsing the occasional short story, but for longer works outlining gives me freedom and structure in the same bottle. *thought that* Can you tell I am the Queen of the Typo??? That's the important part, Randi—that your way works for you! I've been there before myself. I'm pretty organized these days, with most of my notes taking up virtual space on my hard drives, but there was a time when I had index cards and post-its scattered about my office. My laptop has unfortunately never really looked like it does in the pic, though. I also don't like when writers say things like, "my way is the right way." Well, all writers are different, so what works for one may not work for the other. I hear a lot of babble about how you should write your 1st draft and reserve any and all editing for when you're finished, but that doesn't work for me. I'm the rare type of writer who needs to edit as I write my 1st drafts, or I'll go insane. Goes to show that writing isn't a one-size-fits-all endeavor and we all just need to figure out what works best for us. I'm in the camp where I prefer to outline my novels, but very loosely so I can make up most of it as I write. But, I absolutely must have some sort of plan, or road map, before I begin. You're absolutely right, Cathy. As much as some of the pontificators would have you believe their way is the one and true winning formula (and they often have good intentions, to be fair), the truth is that we all have to find our way. I'm in the middle on the editing thing. I do enjoy editing as I go. I usually begin my sessions by reading/editing my work from the previous day. I make sure it's only a cursory edit though, as I can go overboard if I'm not careful. In fact, I have a post-it on my monitor that says "Fix it in revision!" to remind me not to get too deep. 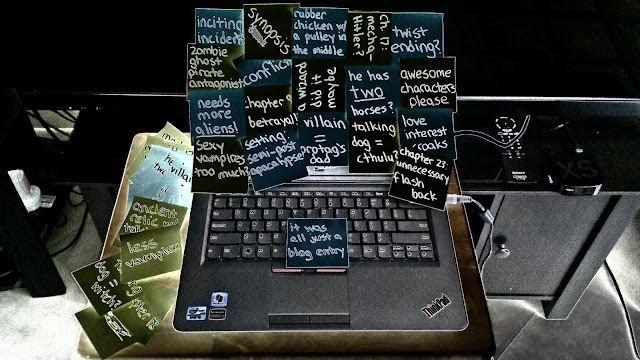 I failed NaNoWriMo a few times in the past, and I used to blame it on an outline. Every time I tried to outline, I failed. I used the outline as my scapegoat. I finally had to accept that it had nothing to do with "writing the novel ahead of time" and more with not having my heart in it. This year, I kinda need an outline; I have an important story to tell, and I need to do it right... and I've already planned out what needs to happen, so I'm outlining it. I'm taking my pants off this year... and hopefully the end result will be a better novel! I think we all have that tendency to want to blame something in the process when we hit a stumbling block, but more often than not, it's just us. That's not to say that outlines are for everyone, but sometimes there's definitely more to look for! I write shorts and sometimes I do a brief outline sometimes I don't. Just depends on how I feel. The books I've started I have outlines for. That's pretty much how I operate as well, Teresa. That freedom is one of the great things about shorts. Sometimes outlines are invaluable; other times it just feels right to pants it. Thanks, Krystal! We definitely all have to find the right path for our writing. Outlines might not work for everyone, but it's not always for the reasons that get tossed out there. In the end, the author has complete control over their work, including how closely to stick to that outline.